All of the staff were fantastic! Thank you for letting me stay there. I loved the location and the view out the windows. The apartment had everything I needed. The fan was extremely helpful in keeping the apartment cool and quiet at night. Only contact was to call when I got in the apartment. The apartment was exactly as portrayed. I checked myself in (with lockbox) easily, the orientation booklet was very helpful (with good instructions for washing machine, for example), internet worked fine, and most importantly, the apartment was very clean. The apartment has high ceilings, big windows, lots of light, is nicely (allthough simply) furnished, has large rooms (especially kitchen and bathroom), and overall was very comfortable. I really appreciated the fact that there was plenty of towels, clean sponges and dish washing soap was provided in kitchen, nice dishes and glasses, well-equipped kitchen, and the bathroom had soap and tp. The neighborhood is great, very local and non-touristy, with easy access to metro line 4. Nearby restaurants are excellent, especially Verre Siffleur and Le Zayer, with good sushi close by also. The only downside is that rue d'Alesia can be a bit noisy with traffic, but with windows closed, it is not a problem. Overall, excellent experience, I would come back and stay again! We arrived early and met Aaron. He was friendly helped us get our luggage into the apartment. Then gave us wonderful recommendations for a late lunch. Very helpful and friendly just what you want after a 9 hour flight. My young family enjoyed our stay. The location was perfect in the heart of the Latin quarter with restaurants and cafes close bye. All the eastern attractions were easy to walk/bike to. The Parisian City Bike stations are also close. Excellent. Professional, great instructions, we felt very taken care of, comfortable and informed from the very beginning. Thank you so much for making our stay in Paris even better! I loved this property and how well managed it was. Both beds were extremely comfortable, the apartment had everything we needed from a drying rack to umbrellas to laundry detergent. The notebook of instructions left in the apartment was extremely helpful. Nice large apartment, comfortable for 3-4 people. Great location. Grocery stores and restaurants close by, next to the Metro, close to a museum/park. The pull out sofa bed was extremely comfortable. Highly recommend this property. We didn't miss the air conditioner since it was not very hot during our stay and we were usually gone during the day. Very helpful! Thanks, we really enjoyed our stay! Wonderful apartment in Amboise, tastefully furnished, and a great view of the Chateau. We had everything we need right in the center of Amboise within walking distance of shops and the Chateau, and Clos Luse. Great living space on the upper floor, and confortable bedrooms. We loved your apartment and recognize that the location was excellent and we also found Krystyna and Aaron very helpful. Thank you very much for an enjoyable stay in Paris. It is truly a magnificent city and the location of your property made all of the sites easily accessible. You should mention to future guests that Cafe Panis, around the corner from your property, is an excellent place for breakfast or other dining needs. Simply put, working with My France Vacation Rentals couldn't be easier! I have stayed in My France Vacation Rentals before and will continue to do so. That, I think, says it all. Everything was so well explained before our arrival that we just called Aaron to let him know we had arrived, and Krystina to say we were leaving at the end of our stay. Both very nice persons. We just wish to be able to return to Le Vaneau apartment in the near future. Every single person with whom I had contact was responsive and professional. My stay was very enjoyable, and I would love to stay there again! I visit France once a year and have for many years. 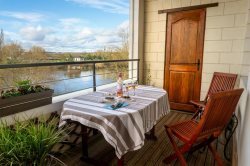 I always book my accommodations in Paris and the Loire Valley with My France Vacation Rentals because their customer service is beyond excellent. Every single person with whom I had contact was responsive and professional. Great apartment! Great owners who communicate very well. Favorite feature of the property - location and layout. Really great place to stay. The pictures and description of the apartment did not do it justice. It was spectacular. The mixture of old (wooden beams and closets) with modern (usb ports over the nightstand and air conditioning upstairs) was exceptionally well planned. The apartment was an easy walk to 'town' with its shops, restaurants and the chateau. Any information I needed was provided in a timely manner. Instructions at the condo are excellent. An Absolute Oasis!! Les Ternes-Etoile apartment is an oasis in a bustling city! Staying here, you will enjoy peace and quiet with absolutely no city noise. A perfect retreat after a long day of sight seeing. The apartment is bright and private, as there is a courtyard separating from neighbouring buildings. Les Ternes-Etoile is a comfortable and spacious apartment. The beds are very comfortable, with flexible configurations, and with lots of spare linens and pillows provided. The kitchen is well equipped with everything you will need for a great stay in Paris! I would not hesitate to stay here again. Thank you Steven & Veronica for making our stay so easy to access, quiet, and comfortable! The location is a short walk to L'Arc de Triomphe and the Champs Elysee. There are 3 large grocery stores close by and within the block a dedicated organic grocery store (Bio). A short walking distance to Porte Maillot, you will find Palais des Congres, a large shopping mall, theatrical shows, and exhibitions. Palais des Congres also contains Galeries Gourmande, a great gourmet grocery store, and a large Marks & Spencer grocery, perfect for tasty treats for here, or to bring home! Most store chains are represented in the area within walking distance, including a great sports store, Decathlon. It was very easy to book the apt. Everything was straight forward and the team easy to work with. Loved waking up every morning and seeing Notre Dame. It is beautiful at night also. It was fun looking out the window and seeing all the activities going on. This is the eighth apt we have rented in Paris and our favorite because of the location. It is within walking distance of many sites as well as restaurants and shops. The metro and RER are very convenient for getting around Paris. The studio apt is a good size for Paris and has an elevator. The king sized bed is very comfortable. Communication was always quick, easy, and friendly. Clear instructions on how to find and enter the apartment and the binder in the apartment that had information on everything we needed to know was much appreciated. Everything was just how we pictured (thanks to all the photos on the website). King size bed was very comfortable, bathroom was roomy for Europe, good size table and plenty of room to relax and enjoy a snack or meal between visiting sites or coming home late in the evening. Having the washer/dryer in the small but very functional kitchen was handy. Being right on the river across from Notre Dame the view of course was tremendous as was listening to the breeze through the trees and the bells. You could occasionally hear the tourist boats passing by and city noise from the street below, too, which we did not mind (part of the experience being in Paris) but the windows and blinds kept the light and noise out when it was time to sleep. Location was perfect for us, within walking distance of many of the sites and museums we wanted to see and bus stops and metro/train stations were very close as well. Several shops and places to eat nearby. We had a great time, Merci! We had an excellent stay at this place. Highly recommended. This property was ideally located, had modern and comfortable furnishings, and the views were absolutely stunning. The property manager (Krystyna) communicated quickly, clearly, and with friendly professionalism. The Le Saint Jacques property was absolutely perfect. First, the Latin Quarter location was convenient to the RER coming from CDG airport and close enough to Metro stops to get wherever we wanted to go. It was an easy walk over to the Ile de la Cite to visit Notre Dame and Saint-Chapelle. There were good restaurants, cafes, and boulangeries close by too. Second, the communications regarding the rental were clear and timely, so all logistics were perfectly smooth. And lastly, the views were almost beyond description. Absolutely breathtaking. My favorite was relaxing in the apartment after a long day in Paris and watching the Eiffel Tower light show. I cannot imagine a more wonderful stay. Thank you. We really enjoyed the area. It was fun to explore a new part of Paris after staying at an apartment in the 13th. For 11 years. It far exceeded my expectations. It was beautiful and totally French. Thanks very much to Krystyna for the timely and detailed answers to our questions and initial queries. Made a good vacation great. Our favorite thing about the property was - Location, Comfort and Cleanliness.